OTWAY-Glowing lights in the sky have several viewers believing extraterrestrials could be hovering over Carteret County. The unidentified flying object was sighted Tuesday and Wednesday night over Otway, which is near Beaufort in Carteret County. 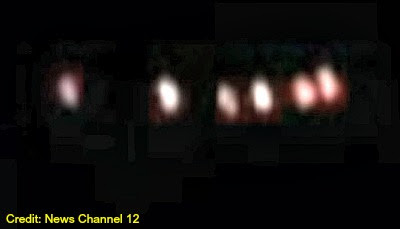 Witnesses describe the object as six orange glowing lights that rotate into a V-shape, then slowly disappear. “It was six lights in a straight line (that were) above everything else,” Otway resident Jonathon Willis said. Willis said his friends first spotted the object Tuesday. . . .
UFOs Seen in North Carolina in 1946?